Ramen noodle soup packages have been around forever and seem to be the “go to” snack or meal for most young adults because they are cheap and easy to make. I wonder how many have actually read the nutrition facts label and ingredients list? Scary! I set out to prove to my students that Ramen noodles could be reinvented to be nutritious without sacrificing flavor. How many of you have prepared/eaten one of the “Ramen Noodle” instant soup packages? Why? Create a list on the board. What is Ramen? Ramen is a quick cooking Japanese noodle served with meat, broth and vegetables. It’s Japan’s version of “fast food”. Does anyone know when these noodles were first introduced, how they were invented and when they became a global food? Let’s find out… play this trivia game about Ramen Noodles as a “pre-test”. Learn more about the history of ramen noodles by viewing the YouTube video “Nissin Noodles – The Instant Meal with a Lasting Legacy” and complete the guide sheet while viewing. Go over the answers and/or collect for a grade, your call. I needed to be out and used this video as a sub plan so I did both. The trivia game questions above could also be used as a quiz or post-test to the video. Discuss: Ramen Noodle Instant Soup packages often get a bad rap when it comes to nutrition. Anyone know why? Have students use their iPads or the internet to investigate and create a list of at least 5 reasons these little packages of convenience are not recommended to be eaten on a regular basis and are considered unhealthy. Here is one website to help you get an idea of what your students should be finding. Share and discuss student discoveries about the nutrition of ramen noodles. So…how can we enjoy the convenience of the ramen noodles in a healthier way? The answer is…make your own noodle bowls using fresh ingredients. First, get rid of the instant soup packages with flavor packs and substitute another type of quick cooking Asian noodle like Soba, Udon or Rice. 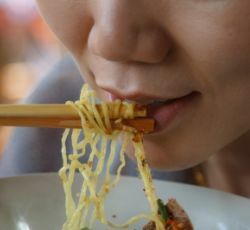 See this article to learn more about the different types of noodles. Prepare the makeover lab: Easy Asian Chicken Noodle Soup (a.k.a. Homemade Ramen). Included with the recipe is a nutrition facts label made from the ingredient list and amounts. This way students can see how much healthier the make over recipe is compared to the packaged mixes.